We arrived in San Francisco after midnight, California time, and promptly went to a party. 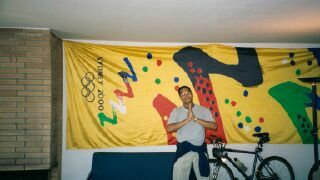 We found time to snap a picture or two of Greg posing against a Sydney Olympic banner (see below). (Late) the next morning we (Greg, Mandy, a house guest of hers, and me) all piled into the car and headed for the hills, passing through the Presidio to get to the Bay. 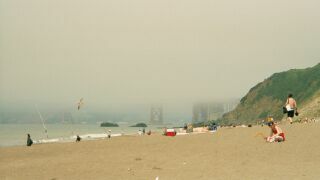 It started sunny and then, in that inimitable San Francisco way, ended up cloudy as you could possibly imagine. We never did see the entire Golden Gate Bridge that day. However, we did see the Russell Stover Blimp. The what? 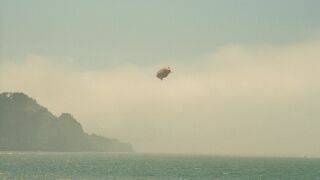 Yes, Virginia, there is a Russell Stover Blimp, and I have proof. However, in the best tradition of all shots of rare and unidentifiable objects, you have to look VERY closely at the picture and use your imagination to read the logo on the side.